What? Santa's got a tough job—stuffing oneself down a chimney is no easy feat. And have you ever smelled a reindeer? Worse than a Tauntaun. 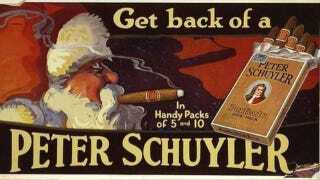 So when his shift is over, Santa could use a smoke. Our friends at Oobject have assembled 12 of his favorite brands. After you burn through this list, check out these less-than-honest cigarette ads, condom commercials from around the world, and these unimpressive computer spots.